The first time my mom listens to the little one say her first word, there's no doubt Mum feels proud and happy. The Little One's first words are of course just the beginning. As the vocabulary grows, the words of the Little One will flow profusely. Before Mum realizes, the Little One will chatter nonstop. When your child has begun to communicate, Mum can already use words to tell how much Mum loves the little one. Parents play a big role in the early stages of language development/child communication. Research shows that talking to newborns will help build better vocal abilities and a greater vocabulary later on. So what are you waiting for, take every opportunity to talk to the little one since he was born In addition, Mum can also ensure that your child gets the right nutrition to encourage better brain development and memory of the new vocabulary? 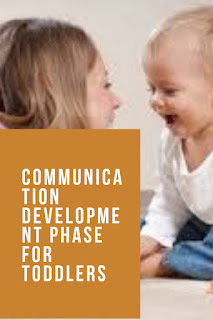 Want to know how far the stage of language development/communication of the child? Try to compare the progress towards the development stage below. Children begin to speak the first words (maybe the magic words 'mama' or 'chest') and in the end will be able to speak 6-20 vocabulary words, and understand more. Able to respond to simple requests such as 'Please close the door', especially if aided by hand gesture gestures. Children will try to repeat Mom's words, especially words with vowel sounds or words that end sentences. Will try to join in the poem. Using 2 words that are linked together and make sentences in two simple words. Speak with keywords, but lose the conjunctions. M refers to its own name and talking to yourself while playing. Children will have a vocabulary of more than 200 words when approaching their 2nd birthday. Children recognize the names of people who are familiar with themselves and recognize the names of body parts (such as eyes, nose, ears). Able to have a simple conversation, using sentences with 2 to 4 words. M enjoy the repetition of his favorite stories. Able to count to 10. Children can speak quite well and are easily understood by others. Able to communicate and use a few short sentences with correct grammar. M can mention the most familiar things, including his own name, age and gender, and friend's name. Use words like 'me', 'we', and 'you' and several plurals such as 'car', 'cat' and 'dog'. Start asking lots of questions. This development stage is only an outline guide. The speed of development of each child is different. It is very important to allow your child to learn with a level of speed that is comfortable for him.